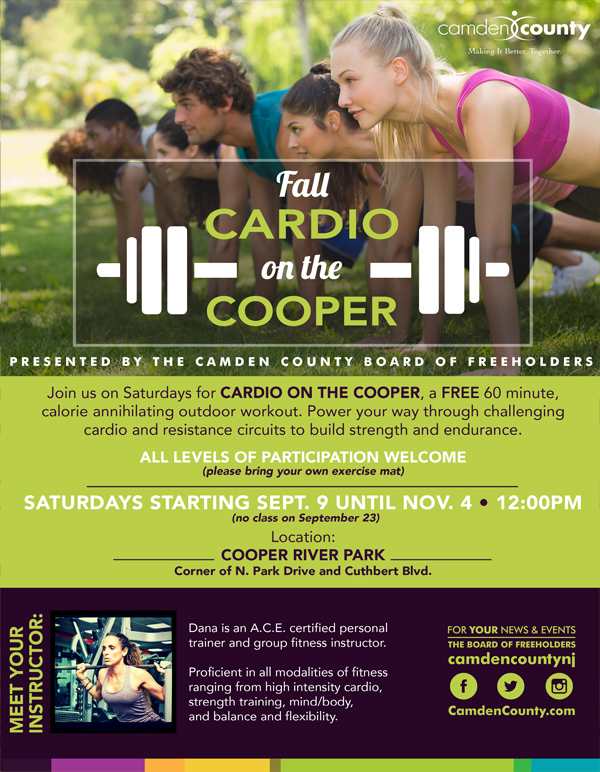 Join us on Saturdays for Cardio on the Cooper, a free 60 minute calorie annihilating outdoor workout! Power your way through challenging cardio and resistance circuits to build strength and endurance. Your instructor is Dana, an A.C.E. certified personal trainer and group fitness instructor. She is proficient in all modalities of fitness ranging from high intensity cardio, strength training, mind/body, balance, and flexibility. All levels of participation are welcome. Please bring your own exercise mat. This event is presented by the Camden County Board of Freeholders. It will be taking place at Cooper River Park at 12 PM on Saturdays starting September 9 until November 4. There will be no class on September 23.